Dermatology practices often deal with denials and even audits because the complexities of billing and coding lend themselves to a lot of billing and coding errors. Billing and coding for dermatology requires detailed reporting, detailed information on procedures completed and following multiple procedure rules. Throughout the past several years, multiple changes have been made to dermatology codes, and staying up-to-date with the latest changes is essential for dermatology practices that want to reduce costly denials and improve practice revenue. Here’s a closer look at some of latest changes to be aware of in dermatology billing and coding. Code 96573 is a new CPT code that is used to note photodynamic therapy using external application of light to eliminate premalignant lesions of the skin and the adjacent mucosa. This is a distinctly different service than the code 96574, which includes debridement of premalignant hyperkeratotic lesions and then following it with photodynamic therapy with the external application of light. While these were CPT code changes for 2018, new CPT code changes will be coming out for 2019 soon, so it’s important to make sure your billing and coding staff stays up to date on the newest CPT codes for dermatology. Most of the medical billing companies are fast becoming claim processing companies only. They don’t have coding expertise to review medical records for correct ICDs and CPT code. Many a times machine learning computer- assisted coding (CAC) does not adequately capture all the codes, the sequence of the primary code along with proper modifiers. The use of modifiers in dermatology coding is often one of the least understood topics. Here’s a look at a couple of the common dermatology modifiers and how and when to use them properly. According to CMS, the “25” modifier is defined as, “A significant, separately identifiable evaluation and management [E/M] services by the same physician on the same day of the procedure or other service.” While this sounds quite simple, it’s one of the most misused modifiers, and it’s important to note that the modifier should only be used along with E/M codes for patients who are already established with the practice. Don’t use it with new patients or along with procedure codes. While 1100x, 1711x, and 1700x codes include most E/M code elements, it’s generally not appropriate to bill E/M codes along with them. However, there are exceptions. For example, if you see a patient with a lesion that you decide needs a biopsy, then your 1100x code will stand alone. However, if the patient notes that she also has a rash that’s developed elsewhere on her body, then it’s appropriate to use another E/M code along with the “25” modifier. One of the most misused modifiers is the “59” modifier, and for this reason, the X-modifiers were issued by CMS as a subset of the “59” modifier. With this modifier, you can unbundle codes so distinct procedures can be billed, and the claim passes Medicare’s bundling edits. It’s important to understand the recently added X-modifiers, because if an X-modifier applies, you should use it in place of the “59” modifier. Learn more: How to correctly use and apply common dermatology modifiers in our article on Understanding Medical Coding Modifiers in Dermatology Specialty. With recent ICD-10 coding changes, new CPT changes for 2018 and the inevitable ones coming for 2019, and the complex nature of dermatology modifiers, many dermatologists choose to outsource their billing and coding to professional companies that understand the intricacies of dermatology billing and coding. It’s important for billing and coding professionals to understand the many procedure rules for dermatology CPT codes, a full understanding of modifiers, as well as an understanding of post-op periods. Not only is insurance reimbursement ever-changing, but dermatology practices are expanding beyond medical and surgical to provide a wide range of cash-based cosmetic services. The success and revenue that comes into your practice depend on good billing and coding practices, and in a very complex field, outsourcing has the ability prevent denials, reduce audits, and boost your practice revenue. 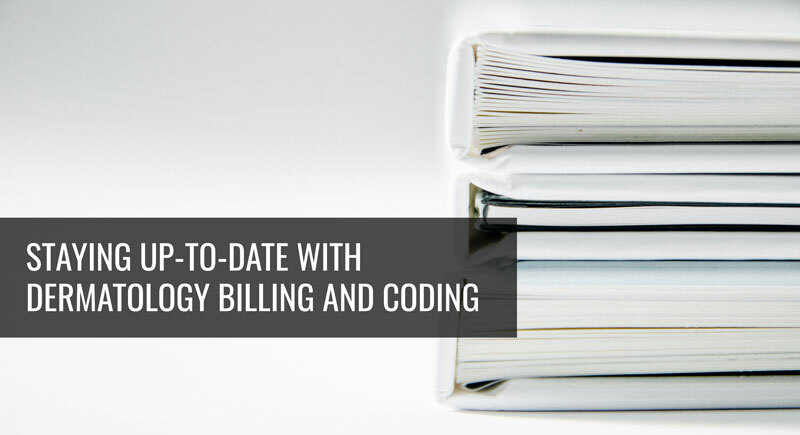 It’s important to choose the right medical billing company for your dermatology practice since it requires complicated dermatology coding.In the fast-changing healthcare environment you need a company who know dermatology specific expertise with in-depth coding knowledge. M-Scribe offers nationwide dermatology billing and coding services and has the expertise to handle the complexities of dermatology coding. Contact Us today to learn more about how we can help your practice. Next PostNext It’s Pop Quiz Friday 8/3! Let’s see if you get it right!